What first lured me to Oso Flaco Lake were the magnificent sand dunes that surround it. Hidden within a sea of sand, the lake is a safe haven for many bird species. 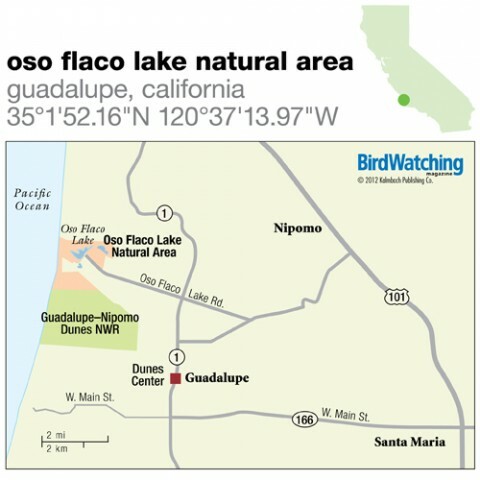 Oso Flaco Lake Natural Area is managed by California State Parks, and together with adjacent Guadalupe–Nipomo Dunes National Wildlife Refuge, the protected areas form the most intact coastal dune ecosystem on the entire West Coast. Chuck Graham is a writer and photographer who writes often about birds in California. 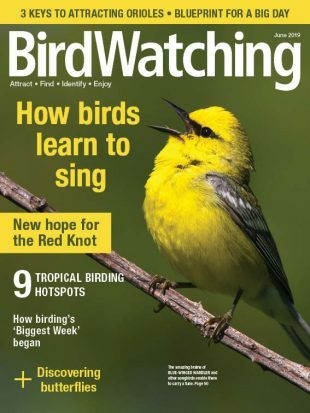 He also wrote about Carpinteria Salt Marsh, Carpinteria, Hotspot Near You No. 116, Soda Lake, Bakersfield, No. 123, Cachuma Lake Recreation Area, Santa Barbara, No. 151, Elkhorn Slough, Moss Landing, No. 154, Mendocino Headlands State Park, Mendocino, No. 167, and Hearst San Simeon State Park, Cambria, No. 185. Oso Flaco Lake Natural Area protects coastal sand dunes, a lake, and wooded areas on the central California coast. From north- or southbound Hwy. 101, exit on Hwy. 166 in Santa Maria and go west nine miles. Turn right on Hwy. 1 and drive north 3.75 miles. Turn left on Oso Flaco Lake Rd. and continue three miles to the natural-area parking lot. Riparian corridor, lake, creek, coastal sage scrub, sand dunes. Mostly flat. Round-trip walk from parking lot is 2.5 miles. Boardwalk is wheelchair-accessible. More than 200 species. American White and California Brown Pelicans, California Least Tern, Western Snowy Plover, Cinnamon and Green-winged Teal, Northern Shoveler, Ruddy Duck, Gadwall, Northern Pintail, Lesser Scaup, Surf Scoter, Heermann’s, Bonaparte’s, and Western Gulls, Pied-billed and Western Grebes, Belted Kingfisher, Tree Swallow, Cooper’s Hawk, Osprey, White-tailed Kite, Red-tailed and Red-shouldered Hawks, Double-crested Cormorant, Great Blue and Green Herons, Great and Snowy Egrets, American Bittern, Song and Golden- and White-crowned Sparrows, Dark-eyed Junco, Nuttall’s Woodpecker, Marsh Wren, Red-winged Blackbird, Sora, American Coot. Two boardwalks (one over the lake, another through stabilized dunes) and a viewing platform that offers views of the ocean. The Dunes Center, located at 1055 Guadalupe St. in the town of Guadalupe, has exhibits, a gift shop, map, checklists, and restrooms. State park. Open year-round. Admission $5 per vehicle. Dunes Center open year-round Thursday through Sunday from 10-4. 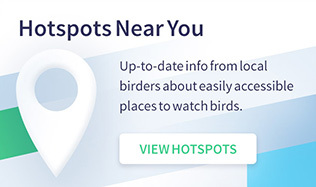 Bring a spotting scope to scan the dense cattails, tule reeds, and willows that surround lake. Dunes closest to the beach are prime nesting habitat for Western Snowy Plover. Heed all signage to avoid trampling sensitive habitats or stressing wildlife. The Dunes Center, (805) 343-2455. Accessible from Oso Flaco Lake Natural Area. Dunes rise 500 feet high at the edge of the ocean. Least Tern, Western Snowy Plover. About 10 miles north of Oso Flaco Lake, off Hwy. 101. Oceanside parks provide habitat for Brandt’s and Pelagic Cormorants, Pigeon Guillemot, and Black Oystercatcher.